‘Going for a walk’ is a peculiarly English thing. It has little to do with physical exercise or hiking; it doesn’t involve rucksacks and energy bars. It’s just popping out for a bit of fresh air, or maybe a stroll round the block. If you have a dog, then there’s that additional sense of purpose, but if you don’t, it doesn’t really matter: no one will judge you. You don’t need fancy trainers, there’s no lycra involved. It’s just going for a walk, getting about like people have for most of the past two million years or so, since homo erectus started tottering about on hind legs. Living in Delhi, perhaps the least pedestrian-friendly city on the planet, it’s the one thing I really miss. It’s a perilous undertaking – going for a walk – requiring constant vigilance: potholes, mud, crazy traffic, honking, swerving, sudden craters, rubble, sleeping dogs, miscellaneous excreta, rubbish, dust storms, heat… So, the outside being what it is, I decided to read about walking instead, and turned to Rachel Joyce’s charming The Unlikely Pilgrimage of Harold Fry. When Harold pops down the road to post a letter, he has no idea that he has just taken the single step on a long march that will take him, if not the thousand miles that Chairman Mao predicted, then not far off: 627, to be precise, from Kingsbridge on the south coast of Devon to the Scottish border town of Berwick-upon-Tweed. 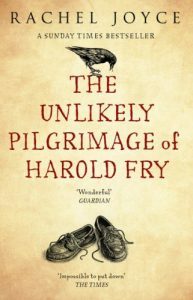 The novel follows this unassuming middle-aged husband in his very slow, very simple quest to walk to Berwick where an old friend of his lies dying of cancer. She had once performed an act of kindness for him which, twenty years later, he feels he must thank her for, in person, and that only by walking will he ensure that she lives, at least as long as it takes him to get there. Yet even more than the relentlessness, more than simply not giving up, Joyce’s novel offers the possibility of redemption. Harold’s is no ordinary walk, after all: it is a pilgrimage, however unlikely. Along the way, he learns of the random kindness of strangers, and its remarkable abundance. And ultimately, like so many journeys – and somehow especially those on foot – the realization that the further you travel the closer you get to where you started: changed, perhaps, but returned home.